Material – In addition to traditional wood, entry doors are available in fiberglass, metal and composite materials. Each material has its own unique set of features, but they are all durable and long-lasting, and can withstand temperature extremes. Look for an insulated core to ensure energy efficiency. You can choose a solid front door, or, for increased natural light, choose the kind with glazing or combine it with sidelights. We offer ProVia® entry doors, available in both fiberglass and steel, and come in a wide variety of customization options. Style – Most homeowners choose hinged, single-sash entry doors by default. But, there are other styles that may be a better fit for your home. If you are planning on expanding your entryway, a French-style entry door – similar to French patio doors – would be a great way to really open up your home. If space is a consideration, sliding doors are a great option and complements similar window replacement styles. Glazing – Glazing or glass panels are more than just a decorative element. It allows for more natural light and adds a layer of security by letting you see who’s knocking. Whatever style you choose, make sure it’s insulated glazing. Since glass is a naturally conductive material, uninsulated glazing could have a negative effect on your home’s energy efficiency. 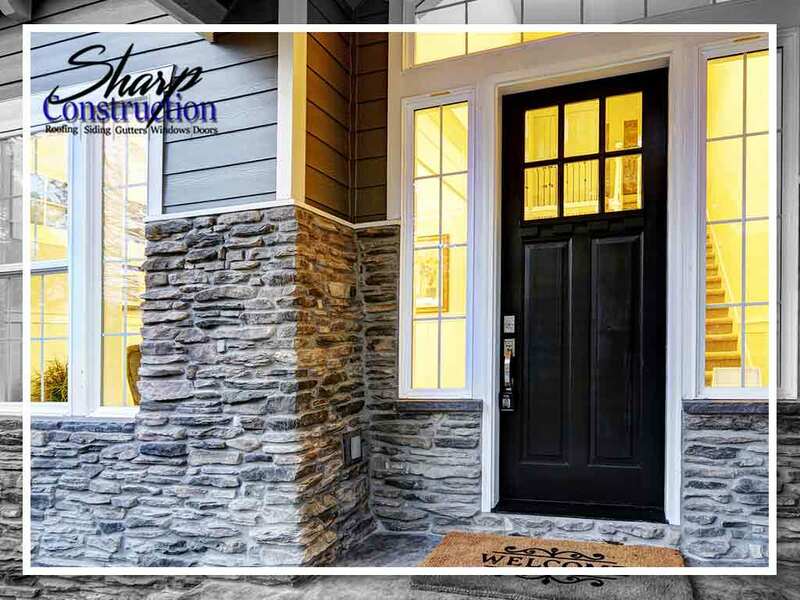 To learn more about buying a new door or if you need roofers for repairs or replacement, call Sharp Construction, LLC today at (616) 222-0850. You can also fill out our contact form to schedule a free in-home consultation and estimate. We serve Holland and Muskegon, MI, and the surrounding areas.